This weeks miniature painting is of a California quail. I love these little guys! The males are so flashy with their top knot and intricately marked feathers. They love to perch on top of something and call loudly "chi-ca-go!". 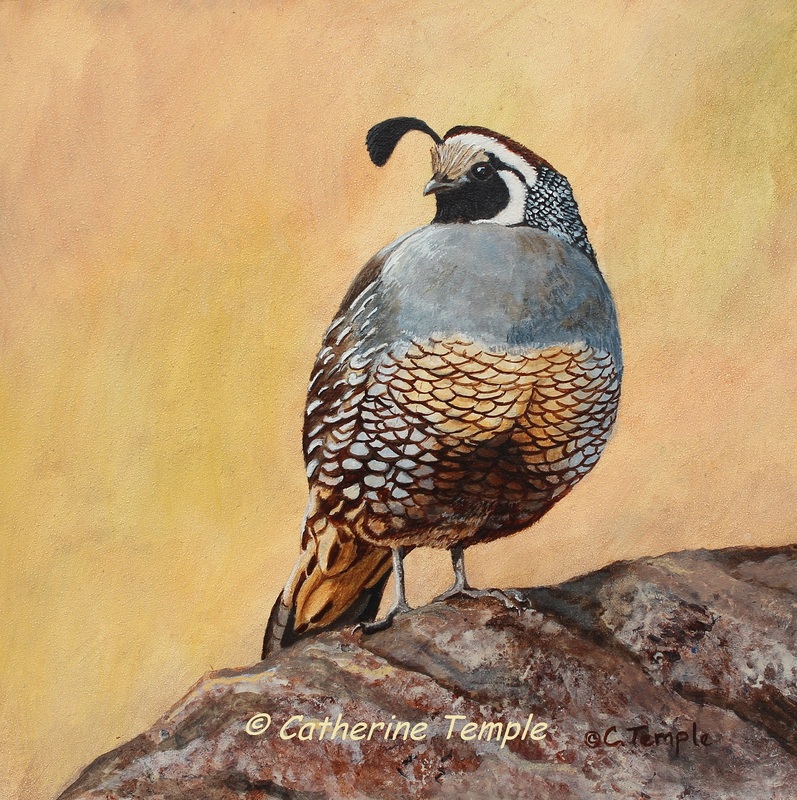 California quail are often seen in large coveys and tend to run everywhere together. When pressed they will eventually flush and fly a short distance before lighting and running off again. If you don't know they are nearby a whole covey of quail flushing at your feet is nearly heart stopping! I know. It's happened to me often! 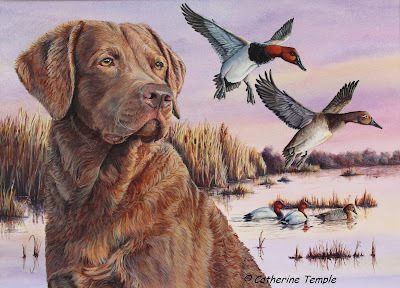 Twilight Hunter is a continuation of my series of miniature or small format paintings. This one measures 6" x 6". As with all my paintings there is a story. In December of last year Snowy owls were again reported in my area so I went out late one afternoon to see if I could locate it. I did indeed find it hunting about 300 yards out in a field. It was too far out for decent photos so I watched it through my binoculars until it finally flew off into a canyon that I couldn't access. By now it was getting darker so I headed for home with thoughts in my head about the white owl. Up ahead I noticed a bird on a fence post and I assumed it was a red-tailed hawk as they are quite common in this area. As I drove by I realized it was an owl I had never seen before. Out loud to myself I'm shouting "owl, owl, owl!" while trying to slow down from 50 m.p.h., checking my rear view mirror for traffic and to see if the owl flew, looking for a safe place to turn around, and grabbing for my camera. All at the same time, of course! Luckily everything was in my favor and I was able to drive slowly back toward it without spooking it. I had just enough time to get a few good reference photos when I noticed a large semi coming up behind me. With nowhere to pull off safely I had to move or risk being smooshed by the looming truck. As the semi whooshed by the owl flew off to hunt somewhere with less traffic, but not without leaving me with images of it reflecting the soft, low light of the day. 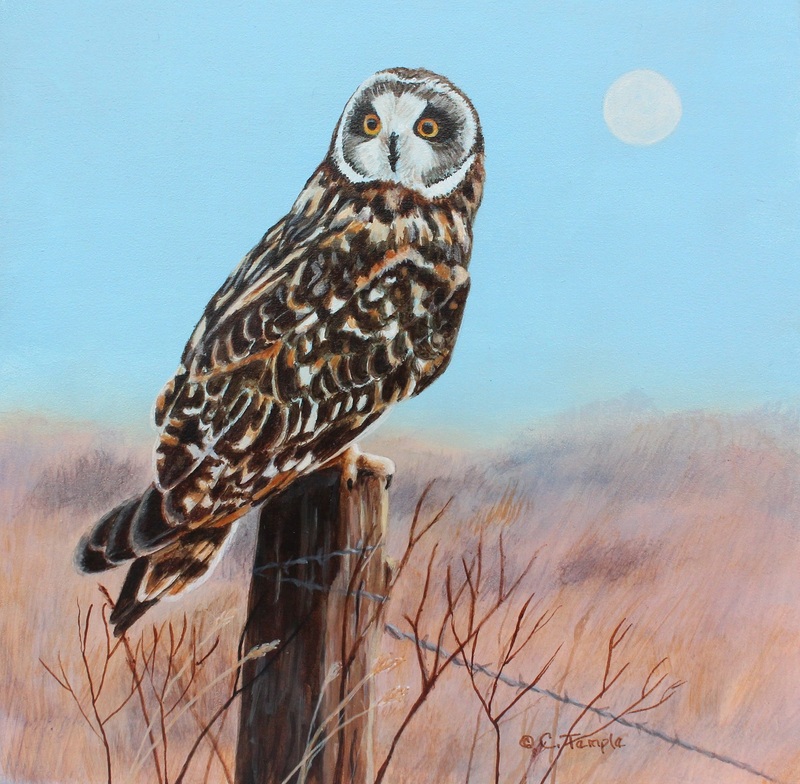 Short-eared owls are birds of open grasslands and fields. They hunt both day and night, but are most active at dawn and dusk. They are one of the most widely distributed owls in the world, found across North America, South America, and Eurasia, and on many oceanic islands. They are mottled brown in color and do have very short feathers on top of their heads that they sometimes raise like ears. What I like about them is their beautiful color and those enormous yellow eyes. While out on a walk recently I came across this beautiful little duck, a female Bufflehead. She had just surfaced from diving for food and was resting, completely motionless in the water. Tiny droplets of water sat like little diamonds on her tail. The day was calm, the water like a mirror and she was perfectly reflected in it. The cloudy skies kept the lighting even and the contrasts low creating a quiet study in shades of gray. We watched each other for quite a little while and I was struck by the subtle beauty of this tiny duck. Female birds are so often under appreciated because they lack the bright colors of the males, but their understated colors have a beauty all their own and serve an important purpose. During the nesting season it keeps them hidden from predators and helps to ensure the survival of both her and her ducklings. Watching her gave me a sense of calm and I knew that I would paint this moment and share something that might otherwise go unnoticed for it's lack of color and simplicity.